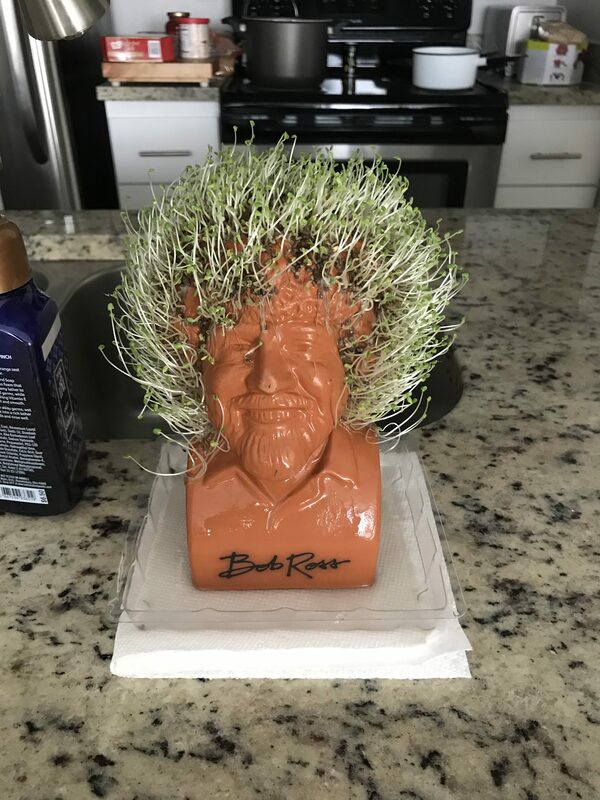 Even a Chia Pet can get a little out of control. Yes, the fine people of the Chia Pet dynasty have marketed a Bob Ross Chia Head in their line of products. It was a no-brainer on their part, really. Aside from his artwork and his happy little soothing approach to life, his most distinguishing feature was his hair. As the story goes, he created the trademark look after he realized he wanted to save money on haircuts. Therefore, he had it permed to reduce the necessity for trips to the barber shop. And—as the story also goes—he wasn’t crazy about the style, but once it was intertwined with his personal brand, he had to keep doing it. Lucky for all of us. Otherwise, his Chia Head wouldn’t exist. I received one as a gag gift. Since my ability to keep plant life alive is marginal—and that’s really stretching it—I decided to give it a try while keeping my expectations low for a full ‘fro harvest. Soak the planter, preferably for an hour. Mix the seeds in 1/4 cup of water. The consistency is the tricky part; they have to be slimy enough for moisture to facilitate growth, but dry enough not to slide off Bob’s contoured skull. Take a spoon, knife, fingers, or other object and spread the seeds evenly over the planter. Don’t water the planter for two days. The seeds have to dry and stick. The “spread seeds evenly” part is just as tricky as creating the right seed-to-water ratio. The first attempt I made, most of the seeds slid off of his head in a gooey, clumpy mess. The second, more successful time, I used less water, so I had fewer gooey, clumpy messes; still, they happened. I doubt that “even distribution” is completely possible on a grooved surface like ol’ Bob’s noggin. 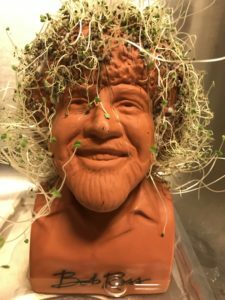 I watched Bob carefully after I applied the coating, using a plastic knife to spread renegade seeds back on to his head if they began to melt away. I was redistributing seeds almost every thirty minutes that first day. 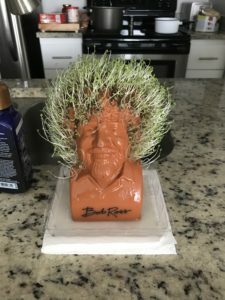 I wasn’t about to sacrifice sleep over a Chia Head, so I went to sleep that night and hoped I wouldn’t wake up to find a pile of hair plugs in Bob’s drip tray. When I woke up the next morning, most of the seeds that decided to slither went down the nape of his neck, meaning that I was in danger of raising a Chia Michael Bolton if I didn’t fix the situation. They were still somewhat spreadable, so I redistributed more to the top, and, for the most part, they stayed. Think of it like frosting a really lumpy cake made of brick. 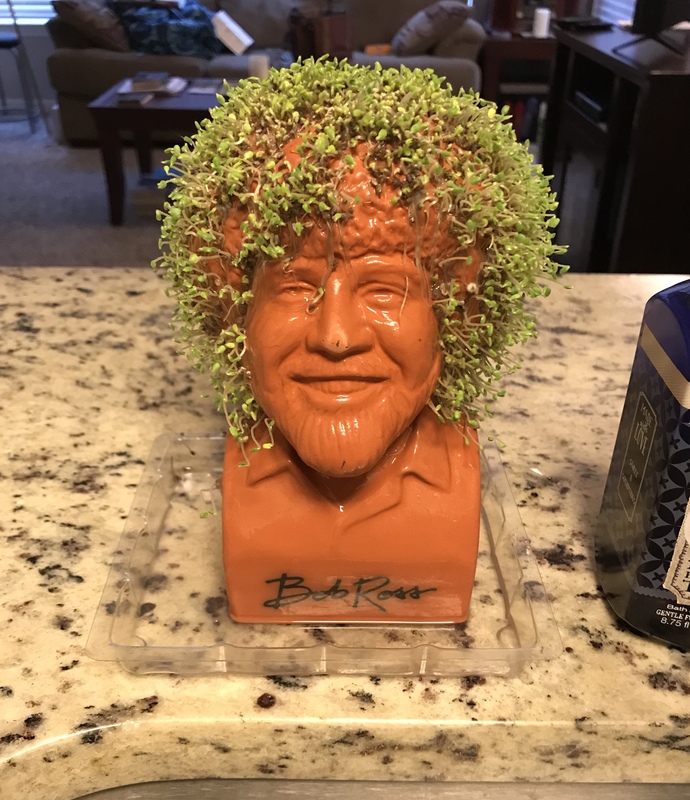 As everything dried over the next 24 hours, I thought I had a fighting chance of my Bob Ross looking like the picture of Bob Ross on the box. 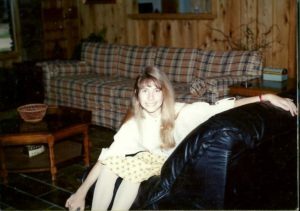 The following day, the seeds had sufficiently dried, so I watered the planter as directed. Slowly, but surely, Bob started to sprout. Sure, he had a few bald spots, but he was already looking better than my first attempt…in which I had accidentally turned the faucet on his head and created a reverse mohawk. He also had a renegade sprout growing near his eye, but it gave him character. What they don’t tell you is that, like any other hairstyle, you only have a window of about 24 hours that it’s exactly the correct length for your taste. One day past that window, Bob was looking somewhat disheveled. Two days later, he looked like years of paint fumes were really doing a number on his state of being. Looks like he picked the wrong week to quit…oh, never mind. Finally, when he started to resemble Einstein’s crazy nephew that no one in the family talks to anymore, I declared an end to the experiment, putting Bob in the sink for a shave. I’m sure I’ll buy more seeds for future adventures with the happy little guy, but for now, I’m taking a break from gardening after proving that I can keep plant life alive—and some.